In Havana beyond the Ruins, prominent architects, scholars, and writers based in and outside of Cuba analyze how Havana has been portrayed in literature, music, and the visual arts since Soviet subsidies of Cuba ceased, and the Cuban state has re-imagined Havana as a destination for international tourists and business ventures. Cuba’s capital has experienced little construction since the revolution of 1959; many of its citizens live in poorly maintained colonial and modernist dwellings. It is this Havana—of crumbling houses, old cars, and a romantic aura of ruined hopes—that is marketed in picture books, memorabilia, and films. Meanwhile, Cuba remains a socialist economy, and government agencies maintain significant control of urban development, housing, and employment. Home to more than two million people and a locus of Cuban national identity, Havana today struggles with the some of the same problems as other growing world cities, including slums and escalating social and racial inequalities. 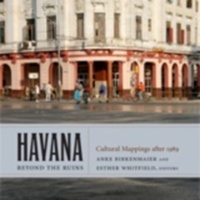 Bringing together assessments of the city’s dwellings and urban development projects, Havana beyond the Ruins provides unique insights into issues of memory, citizenship, urban life, and the future of the revolution in Cuba. Anke Birkenmaier is Assistant Professor of Spanish at Indiana University. Esther Whitfield is Associate Professor of Comparative Literature at Brown University. 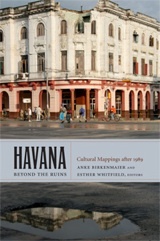 NC, “Havana beyond the ruins : Cultural mappings after 1989,” Crévilles, consulté le 21 avril 2019, http://crevilles.org/items/show/24272.